What is a one time usage license for a WordPress design theme for Fashion & Beauty News ? After Beauty Blog WordPress theme purchase you can put your copyright to the template. But you cannot place a line at the bottom (or any other spot) of the customized project saying "Website design by Company name". Nevertheless, you can place "Customized by Company name". If you purchase the product at a â€˜Buyout price' it guarantees that you are the last person to buy this template from us. It means that this WP theme for Bath and Spa Accessories may have been sold before a couple of times (see â€˜Downloads' number in item's properties) but only you and people who bought the template before you will own it. After this kind of purchase the template is being permanently removed from our sales directory and is never available to other customers again. The buyout purchase license allows you to develop the unlimited number of projects based on this template, but the template should be customized differently for every project. Best Design and client love it so much. 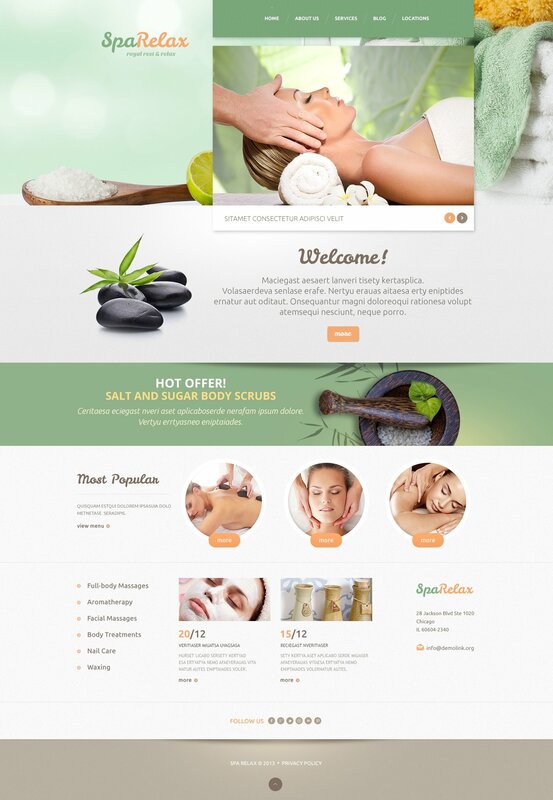 Beautiful html template, it fully suited my needs. With parallax effect and the map integration, it looks even more professional, also looks great in tablets and phones. Great template. Easy to work with, easy to customize. Any issues I had were answered right away with the live chat services. I really love this theme. It&rsquo;s modern and looks great on every device. However &ndash; it&rsquo;s not for beginners. You need to have knowledge and experience to create site like this one in demo. It took me a few days before I do it, and still I have many problem to do it correctly. So, if you are expert in WP &ndash; this theme is for you. Otherwise try to find something else. this template was selected by my client due to its vibrant colors and how closely the theme is related to what she is going ro show on the site. My client is doing a foot reflexology and beauty services thus having this theme made it easy for me and her to get a estimated idea on what the final product would be. In overall, my client is very satisfied with the template. I feel that if some headings such as Logo text in h2 and normal headings in h2, if there are two settings to differ them it will be good as it will be easier to customise. great template as usual, responsive and very easy to set up! It&#039;s a great theme! A++++! Is the demo content (as a live preview) included? Hello, where do I find the 24/7 Free Support?